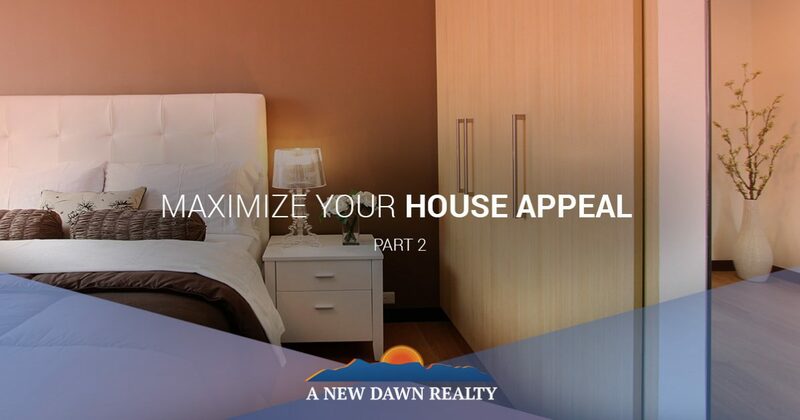 In our last blog, we talked about some of the things that you can do easily and quickly to help maximize the appeal of your home before you put it on the market. In this blog, we will cover some additional items that you want to make sure you cover so that your Stokesdale house can “put its best foot forward”. Today’s tips will cover some very easy, quickly accomplished tasks that will help you to see the progress you’re making. Call A New Dawn Realty today to speak with one of our Realtors® and see how we can help make selling your home a breeze. We doubt you’ve ever found a closet that was big enough for all of the things you needed to put into it. The problem isn’t necessarily the size of the closet, but rather, our human tendency to accumulate and expand to fill the available space. There is absolutely nothing wrong with this, but if you’re trying to make your house look as appealing as possible to potential home buyers, you’ll need to think about staging your closet to maximize the space factor. The key here is to empty your closets until they are just half-full. All of the extra space will really highlight how much storage capacity your closet actually has. Home buyers frequently struggle with the ability to see the potential in a space, and so you need to make sure to truly show them what your house has to offer. For those of you with kids and pets, this can be especially challenging, but it is highly important to help make your house stand out from the others on the market. About ⅓ of your stuff should stay in the house. This means that the other ⅔ need to go somewhere else, and that will probably be a temporary storage space if you don’t have a friend’s basement at your disposal. If you do have kids, one way to make this less stressful for them is to have them choose the allowed amount of books, toys, and games that they would really like to keep. Then you can pull some of those items aside where they don’t have access, and rotate their access to the items to help keep things fresh for them. This is probably one of the easier pieces of maximizing your home’s appeal. First of all, you need to do an inventory of all of the light fixtures in your home. Make sure that there are working lightbulbs in all spaces. Second, make sure to turn on all the lights and open the blinds before you leave your house for a showing. This will help to provide a light, airy feel to your home as well as help with enhancing the size of the space. If you have hanging mirrors, make sure they are in the ideal locations to reflect the light from either the inside light fixtures or the natural outside light. Be sure to call us at A New Dawn Realty today and discuss your home buying and selling goals with one of our experienced real estate specialists. We are proud to work with buyers and sellers throughout Stokesdale and the surrounding areas, and we look forward to working with you!